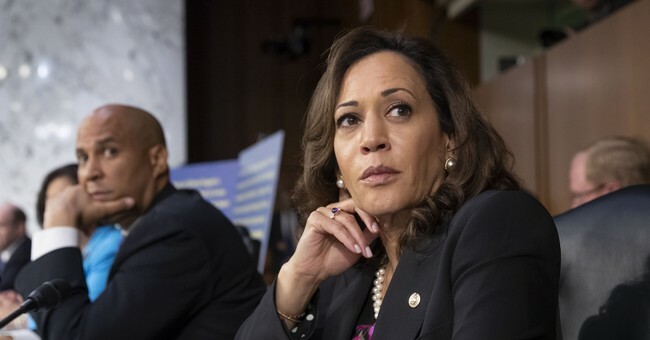 Sen. Kamala Harris (D-CA) accepted the resignation of one of her aides this week after reports revealed that he had been sued for "gender harassment" while working for her when she was California attorney general. The aide, Larry Wallace, reportedly harassed his executive assistant Danielle Hartley, asking her to crawl under his desk on a daily basis and to run personal errands for him. Hartley sued in December 2016, and walked away with a $400,000 settlement in May 2017. Harris's office claims they did not know about the lawsuit or the harassment claims until recently. However, the Sacramento Bee poked some holes in that claim. There are only a few possible interpretations here, and they are unpleasant. Wallace wasn’t out on the periphery of Harris’ staff; he was a senior aide she knew for 14 years — hardly a stranger. For Harris to flatly deny any knowledge of this settlement seems, shall we say, far-fetched. For the moment, let’s take her at her word. Harris has "fallen short" of her responsibility to lead, the editors conclude. She "owes the voters more than just a four word denial on the steps of the U.S. Senate." Republican leaders were among those to cry hypocrite, particularly in regards to how Harris treated and judged then-Supreme Court nominee Brett Kavanaugh.